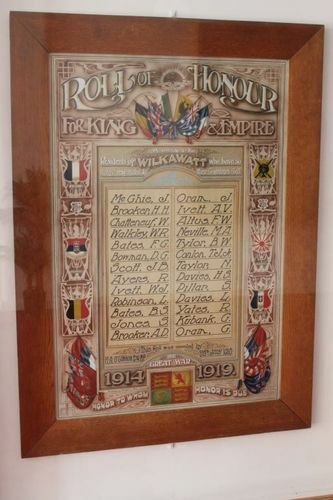 The Wilkawatt Honour Roll commemorates those who served in World War One. Australia Day was observed here on Wednesday last week. Trees were planted in the railway yards in honour of each man who enlisted for active service from the district. Mr. D. F. Bowman (President of the committee) called on Mr. O'Connor, M.P., to plant the first tree in honour of James McGhie. Tea was provided in the public hall, after which a concert was held. Mr. O'Connor unveiled the roll of honour subscribed for by the residents. The Register (Adelaide), 3 August 1916. Note : During the First World War money was often raised for patriotic funds by setting aside a special ‘day' on which activities such as auctions, street collections, performances and stalls were held to encourage the community to contribute. Days such as ‘Belgian Day' were organised early in the War to raise funds to relieve the distress of war ravaged Allied countries. The days also provided some short relief from the deepening tensions experienced on the home front. It was decided that on 30 July 1915 an ‘Australia Day' would be celebrated across the country, and funds would be raised to help the Australian Division of the Red Cross continue to provide their services.